Since the beginning of this March, I have often been seen wearing a hat embroidered with the name of Belmont University. Now, some who see me might think that this behavior is a bit odd. After all, I graduated from the College of William & Mary and have never taken a class at Belmont. So why then do I wear this hat? To answer this question requires returning to the winter of 2007. Back in late 2006/early 2007, I began my employment with Students for Life of America (or SFLA). Although the name might suggest that it is an organization devoted to perpetual studenthood, it is, in fact, a group promoting the pro-life cause on university campuses across the country. In what I believe was their inaugural effort, they hired about eight or so activists to promote the cause and their group throughout the nation. Each of their field representatives was assigned a state or several states. I had the states of Tennessee and Kentucky. Curiously, although bordering or extremely close to my home of Virginia, I had, at that point, never set foot in either. My farthest trip west in a car only had taken me to West Virginia. My first assignment for Students for Life took me to Eastern Tennessee State University (or ETSU for short), in Johnson City. Prior to arriving, I had spoken to a number of students there through a recently discovered website called Facebook and scheduled several meetings to discuss the creation of a pro-life group there. However, things did not proceed according to plan. None of the students ever ended up meeting with me. Nor did they even respond to my messages once I arrived. I spent several days wandering about the campus, looking for a familiar face, speaking to the administration, and trying to salvage the situation the best I could, but the trip proved to be a dismal failure. As an additional penalty, given the pay structure of SFLA, I was paid nothing for this time and effort, a particularly disheartening double whammy. As I returned one night to the local Presbyterian college ministry, which had graciously hosted me during my adventure at ETSU, I got a call from another student I had been in contact with, halfway across the state in a small school called Belmont University. She requested that I meet with them the next morning. Although the hour was pretty late, I had hoped to make yet another try the next day to prevent my time at ETSU from being an abject failure, and Belmont was a good four and a half hour drive away, I pledged to attend this early morning gathering. The next morning, while the sky was still pitch black and my head was a bit groggy due to lack of sleep, I packed up my car and headed to Nashville. When I arrived, I found a situation far more favorable than ETSU. 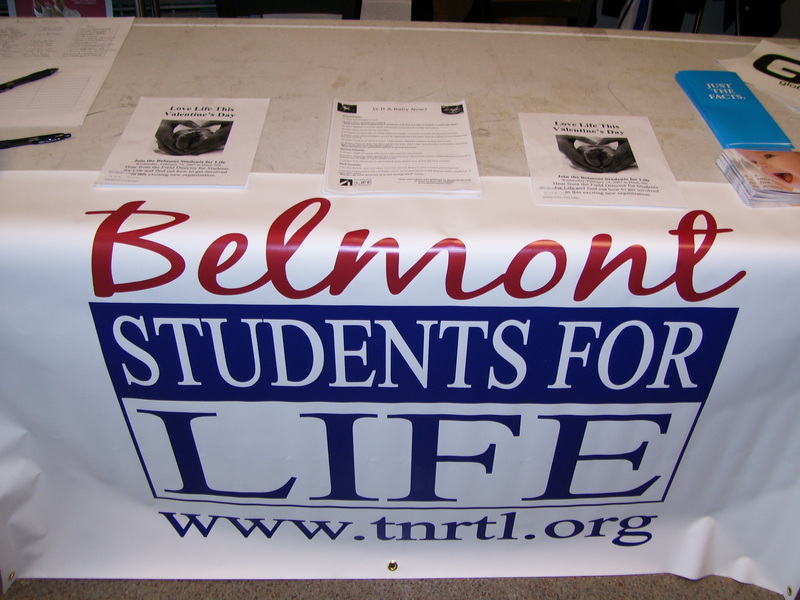 Led by a motivated and strong-willed young woman with a Tennessee accent named Susan, I realized that perhaps I could make a positive impact at Belmont, that there were students here that were as passionate about the pro-life movement as I. It was exciting! And I’m pleased to say that Belmont did not disappoint. As you would imagine, I visited many other colleges and universities in Tennessee and Kentucky during my employment with SFLA (some successful, some not so much). I met a lot of fantastic people, including a whole bunch of great students across the two states and Fletcher Armstrong of the Center for Bioethical Reform. However, due to fantastic efforts put forth by the students at Belmont (and their relatively centralized location), I made Nashville my home base. Even when not working, I spent a good chunk of my free time in the area, going to watch many of the Belmont Men’s Basketball games. I bought a dark blue hat so that I could show my support for the school at these events. And, you know what? They had a pretty good team, one that earned a spot in the 2007 NCAA tournament, a feat that they accomplished for only the second time (up to that point) in the school’s history. Although my prearranged contract with SFLA expired in the spring of 2007, the many good memories I had, especially of Belmont (given that it was my first successful venture in this job), remained. 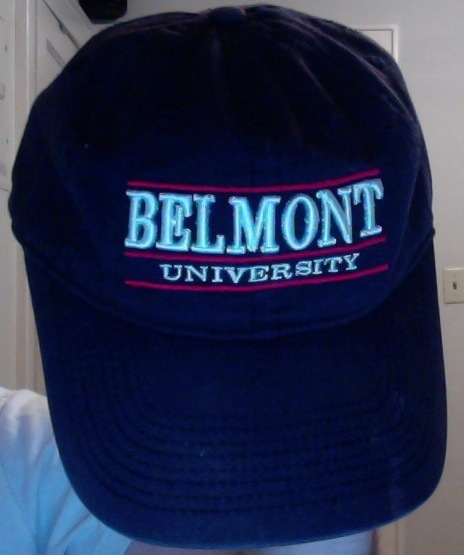 Therefore, as a result, every March, in tribute to Susan, Belmont Students for Life, and their great university, I dig my Belmont hat out of the trunk of my car and wear it while the team remains in the NCAA playoffs (or for a couple of weeks in the years that they do not make the playoffs). Unfortunately, the school has never won a game in the tournament, but I am hopeful that this year will be their first. As so, as March Madness and the 2013 NCAA tournament gets underway, I am proud to don my hat once more. They might not be my alma mater, but Belmont University will always hold a special place in my heart. Update: I decided to wash my Belmont hat in order to get it a bit cleaner. Unfortunately, it has become too tight to wear now. However, a fresh one is on order from their bookstore. Let’s hope it arrives in time for the game on Thursday!